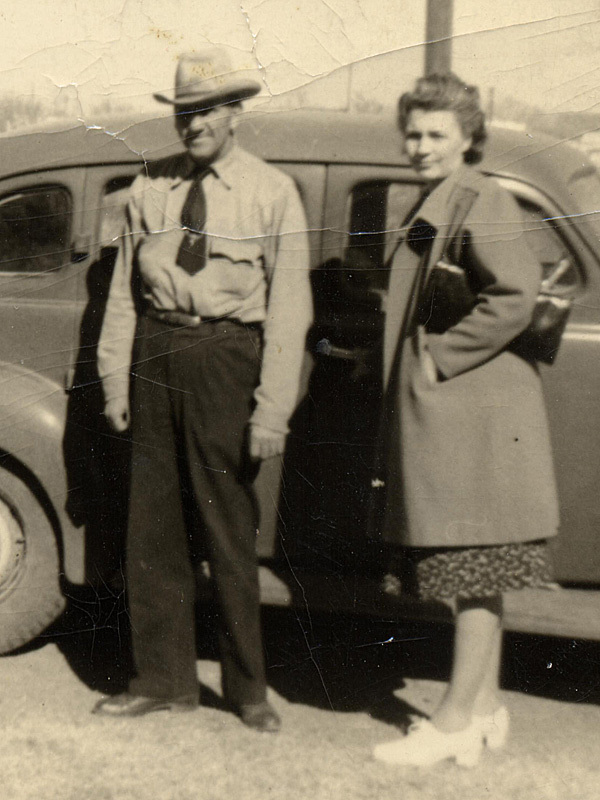 It’s National Grandparents Day, so The Legal Genealogist is told, and in honor of the grandparents I knew, I offer this lovely photo of my mother’s parents. Clay Rex Cottrell, my grandfather, was born in Iowa Park, Texas, on 20 April 1898. His YDNA haplogroup is R-M269, a common European haplogroup that likely began in West Asia. His mitochondrial DNA haplogroup we know from testing the daughter of a daughter of his sister, and it is H, a predominantly European haplogroup. Opal E. Robertson, my grandmother whose middle name remains a stubborn secret (and matter of debate in the family), was born in Eagle Lake, Texas, on 21 August 1898. Her mitochondrial DNA haplogroup is the one she passed to my mother and then to me, so we know it is H3g, also in that predominantly European haplogroup. Her paternal haplogroup we know from testing the son of her brother, and it is J-M172, which likely originated in the northern portion of the Fertile Crescent. But there is something more I choose to do today to honor my grandparents. Because some of their daughters — including my own mother — and some of their granddaughters — including me — have had to battle breast cancer in our lives. And because one of my cousins is fighting the good fight right now, today. I choose to stand with the American Civil Liberties Union, with AARP, and with Breast Cancer Action in opposing the patenting of human genes and gene components that stand in the way of women who need affordable genetic tests for breast cancer. And so I am joining with Gene by Gene, parent company of Family Tree DNA, to support the Free My Genes movement — at freemygenes.org. It doesn’t cost a thing. Just a click of a button to “Like” it on Facebook. It’s nothing more — right now — than a way to say you don’t agree with a patent system that lets anybody lock up our genes and our genetic information in a way that keeps the price of genetic testing artifically high. The issue is a hot one right now. It has to do with patents on the BRCA1 and BRCA2 genes, genes that — if present — cause a significantly elevated risk of breast and ovarian cancer, that were issued in the 1990s to Myriad Genetics and its partners, and I’ve written about it before. • In June of this year, the U.S. Supreme Court struck down those patents. You can read about that here: Our DNA can’t be patented. • Two companies — Ambry Genetics of Aliso Viejo, California, and Gene by Gene of Houston, Texas — immediately announced much lower-priced tests for those genes. And Myriad promptly sued them, trying to block the testing based on other patents. You can read about that here: Myriad sues genetic testing firms. • Both of the companies sued are fighting back. Not only did they deny the basic claims in the suit, they’ve countersued, charging that the lawsuit was brought as part of a campaign of “using sharp and overreaching practices to wrongfully monopolize the diagnostic testing of human BRCA1 and BRCA2 genes in the United States.” You can read about that here: Testing firms land counterpunch. Now I’m not naive enough to believe that everyone who opposes patents on genes is doing so out of philanthropic motives. Some of the players are other companies that want to do the tests and make a profit doing so. But I have nothing against profits. The idea of profits sends me to work every Monday — however reluctantly I might otherwise head out the door. It’s when those profits get obscene, and block competition from the marketplace, that my blood starts to boil. And my blood boils every time I think about women who can’t afford these tests, whose insurance companies won’t pay for them, who are held hostage by a patent system where the consumer — the cancer patient — just doesn’t matter. There may be more we can all do to help down the road. For now, educating ourselves and standing together in favor of freeing our genes from the patent system will be a good first step. Thanks for bringing up this important topic, Judy, and for encouraging us to support reasonably-priced testing! Hear, hear! Act, act! Thanks for your support, Judy! I agree with everything you said about our freedom to read the information in our own genomes. Somehow it doesn’t sound any better to me for Myriad’s artificially high prices to be paid for us by Medicare, Medicaid or our private insurance. Indirectly, this is paid for by all of us. Thanks Judy. As a female who has two sisters with breast cancer, I was furious when I found out how much a BRACAnalysis test would cost! The health care system in this country is deplorable! This isn’t the health system, Patricia — it’s the patent law that lets a company own a monopoly. Not that the health system isn’t a problem, but it’s a whole ‘nother problem. While I don’t think that genes should be patented, I’m not sure of a better way to encourage genetic research in a capitalistic economy. Doing the kind of research that Myriad did in the 90’s to discover BRCA1 and 2 is very expensive. Pharmaceutical companies invest this same kind of money into developing new drugs, and then patenting them so that they can recover the costs of the research, so they then “own a monopoly” on that drug for years. Cancer drugs are ridiculously expensive. This is the analogy that Myriad uses when asked about patenting genes, and I don’t think it is terrible. For those that are opposed to patenting genes, what type of system would you suggest companies like Myriad use in order to fund new research and genetic discoveries? For the record, I believe that drug costs and Myriad’s test are inflated, but that is a problem with our overall health care system, not necessarily a problem with patenting genes. Sanger sequencing (which is what Myriad uses, although I think they’re converting) is significantly more expensive than NextGen sequencing, which is one of the reasons their test is so expensive. Also, if you have a family member that has already tested positive, Myriad uses this information to target the specific area of the gene on other tests for members of the same family, and the cost is only about $500 instead of $4000. Additionally, Myriad employs several genetic counselors to review results and make sure that the information given to patients and doctors is accurate and understandable. They are very thorough. Interpreting the results of these tests is much more complicated than just looking for a single mutation – mutations can be insertions, deletions, inversions, SNPs, etc. Any of these may result in a pathogenic mutation in the tumor suppressor protein that is produced by BRCA1/2 or the mutation may not cause any harm at all. There is a significant value in this analysis and interpretation. Lastly, I do think it is somewhat disingenuous of FreeMyGenes to imply that 1 in 8 women will develop breast cancer because they have a BRCA1/2 mutation. While it is true that 1 in 8 women will develop breast cancer over the course of their lifetime, BRCA1/2 mutations are responsible for less than 10% of those cases (http://www.cancer.gov/cancertopics/factsheet/Risk/BRCA) I am a proponent of evidence based medicine, and in light of this, a BRCA1/2 test is certainly not warranted or needed in many cases. If there is a family history, a test should be considered. If testing guidelines are met, then the ACA requires that testing be covered by insurance companies. It is important to note also, that a negative BRCA 1/2 test does not mean that a person will not develop breast cancer. A positive test only means that the risk is increased in comparison to the general population – even a person with a positive test may never develop breast cancer. If a person does test positive and measures are taken to prevent cancer from developing (preventative mastectomy), then the $4000 spent on the test (even though that is a lot) is significantly less than the hundreds of thousands that would be spent on chemotherapy treatment, etc. I would rather indirectly spend $4000 on a BRCA1/2 test for a person that meets the testing guidelines than spend significantly more on cancer treatment. I don’t mean to sound like a Myriad apologist, but this issue is far more complicated than the FreeMyGenes campaign or anyone else would lead people to believe. Thank you Judy, for letting me share my thoughts. I certainly appreciate your point of view and, of course, you’re quite right that BRCA1/2 is not the culprit in all breast cancer. I would note, however, that much of the R&D cost in this case was underwritten by the government and conducted by other researchers all of whom were generally sharing information… until Myriad raced to the Patent Office.